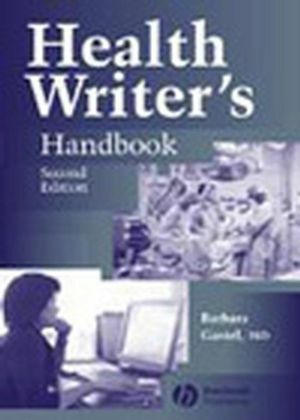 Barbara Gastel, physician and acclaimed medical journalist, has prepared an expanded, enhanced second edition of Health Writer's Handbook. Fully updated, the latest edition of this trusted handbook has grown by nearly 100 pages, solidifying its reputation as a "practical guide packed with specifics on how to write about health intelligently and with sensitivity" (Nieman Reports). Examples of exemplary health writing now abound with insightful annotated comments. "Medical Reporting for the Electronic Media" (contributed by Tom Linden, M.D., University of North Carolina at Chapel Hill) addresses health reporting for television, radio, and the Internet. Also new to this edition is coverage of legal matters in the retitled "Ethical and Legal Issues" chapter. Journalistic exercises bring chapters to a close giving the reader opportunities to apply the principles presented. Health Writer's Handbook, Second Edition is a reference guide and textbook all in one, invaluable to experienced health writers looking to improve their writing and to students beginning their study in medical journalism. BARBARA GASTEL, MD, has faculty appointments in medical humanities, veterinary medicine, and biotechnology at Texas A&M University, where she coordinates the graduate program in science journalism. Part I: Finding Topics and Information. 3. Government, Associations, and Other Institutions. 4. Researchers, Clinicians, Patients, and Others. Part II: Preparing the Piece. 8. Genres of Health Writing. 9. Medical Reporting for the Electronic Media. 11. Award Winners and Awards. Part III: Exploring Issues and Areas. 12. Ethical and Legal Issues. Part IV: Pursuing a Career. References: Sources Cited; Sources of Additional Help or Perspective.